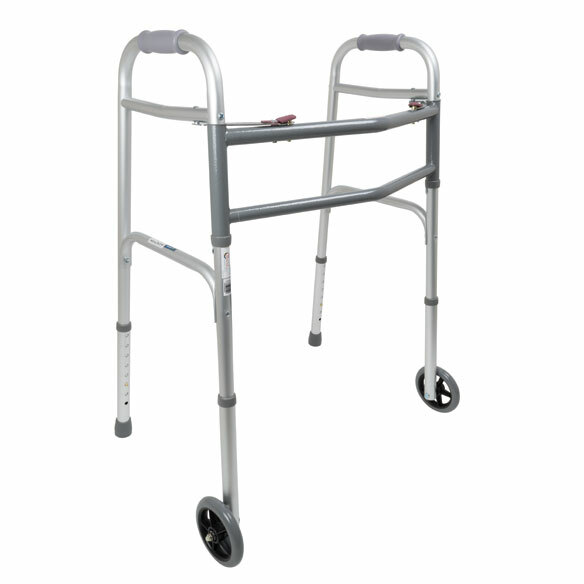 Heavy duty walker with wheels combines lightweight ease with dependable strength. Aluminum frame opens in seconds with a simple push button and folds to just 5 1/2”D for easy transport. Walking is a pleasure with smooth 5” front wheels, adjustable height and vinyl contoured hand grips. Each side of the bariatric walker operates independently for ease in maneuvering narrow spaces. High front cross braces allow for a full stride. Side bar adjusts with height for additional support. Height adjusts 31”–41” for users 5’2”–6’4”. Base measurements are 25 1/2”W x 17”D. Wheeled walker measures 25 1/2”W inside hand grips. Aluminum frame weighs 9.1 lbs. My husband is 6'3" tall. The walker he is using is too short. This is the first one I have found that can be adjusted for his height. MY HUSBAND HAD ANKLE SURGERY AND NOW USES A WALKER CONTINUOUSLY. MEDICARE ONLY SUPPLIES ONE EVERY FIVE YEARS. MY HUSBAND FELL AND BENT ONE LEG SO WE OPTED TO BUY ONE OURSELVES. IS THE BACK LEG THE STANDARD 1" TUBING? BEST ANSWER: Thank you for your question. Yes these are standard 1" tubing. We hope this information will be of help to you.